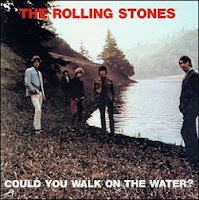 After over eight-and-a-half years of living in the Los Angeles area I had never even heard of the Hollywood Reservoir. That all changed last Saturday afternoon when I drove up the narrow, windy residential roads of the Hollywood Hills to this urban oasis in the shadow of the Hollywood Sign. I joined other young adults for a walk around the lake as part of the alumni organization Birthright Israel NEXT: Los Angeles. High above the smoggy city below, this place is the real Pandora. Lush greenery, crystal clear water and spectacular views of Los Angeles and the Hollywood Sign. The man-made Hollywood Reservoir was built in 1924 and is held by the Mulholland Dam. 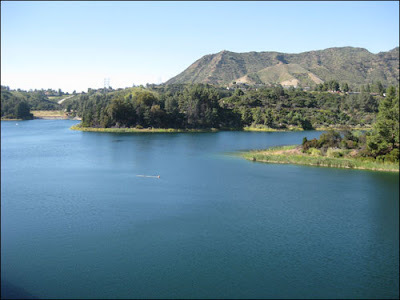 The lake holds 2.5 billion gallons of water and is maintained by the LADWP. Scenes from two 1974 films were shot at the lake -- "Chinatown" and "Earthquake." Also, the Rolling Stones shot their cover picture for the album "Could You Walk on the Water?" at the Hollywood Reservoir.